Two eyewitnesses from the Red Lion Pub on Saturday, August 16, 2003, followed the rotating, wobbling disk to a harvested field of crop stubble East of Cherhill Down and the Gallops. 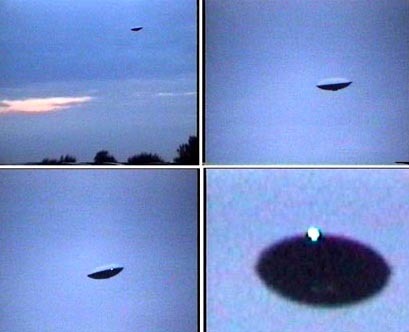 Four enhanced images from the videotape shot by Simon Beard on Saturday evening, August 16, 2003, from Avebury stone circles of the slowly rotating, wobbling aerial disk. See Earthfiles August 20, 2003. Composite by Andreas Mueller, www.invisiblecircle.de. August 21, 2003 - Avebury, Wiltshire, England - This morning I talked with reporters, Lewis Cowen and Tamash Lal, respectively at the Wiltshire Gazette & Herald in Devizes and Evening Advertiser in Swindon, about the multiple eyewitness sighting of a black and white rotating disk over the Avebury stone circle on Saturday evening, August 16, 2003, after 9 p.m., near dark. The reporters concluded in their stories that the object was a "prank," either a camouflaged microlight or remote-controlled model, but neither has any substantive proof. I also talked with eyewitness, John Pearce, resident of Winterbourne Monkton, who is quoted in the articles, but his version is different than the media's.